The primary aim of Aptus Utilities is to provide quality products and services whilst delivering first class customer service. This is achieved by creating and supporting an environment that allows our employees to maximise their full potential by ensuring that they receive all the training, resources and support they need. Furthermore, as a company we set annual quality objectives and measure our progress against these on a monthly basis at board level, in full accordance with our Quality Management System ISO 9001 certification. Our policy and progress against annual objectives are regularly communicated to all employees and subcontractors and we actively seek feedback on how to improve our products and services. Quality of the products we supply: We believe that the multi utility sector has a moral duty to supply a cost effective product that is built to last. Customer experience: We interact with our customers and End Users every working day; these people are important to us, and good customer service is simply good business practice and invariably leads to repeat business. In addition to this, providing an excellent customer experience makes life easier for our client’s site manager. Our policy outlines the way we look to exceed the quality expectations of our product delivery and customer experience. 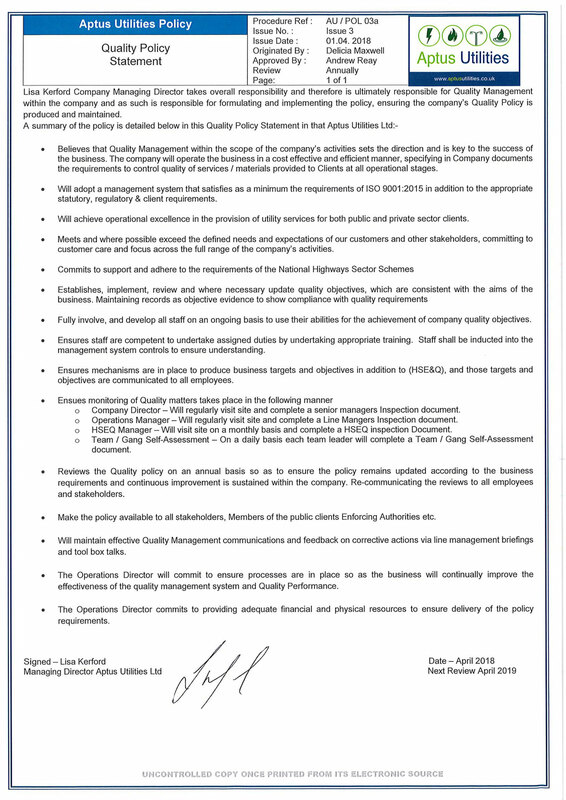 Our Quality Policy can be viewed here.